A 35 yo male with headache and visual field defect. 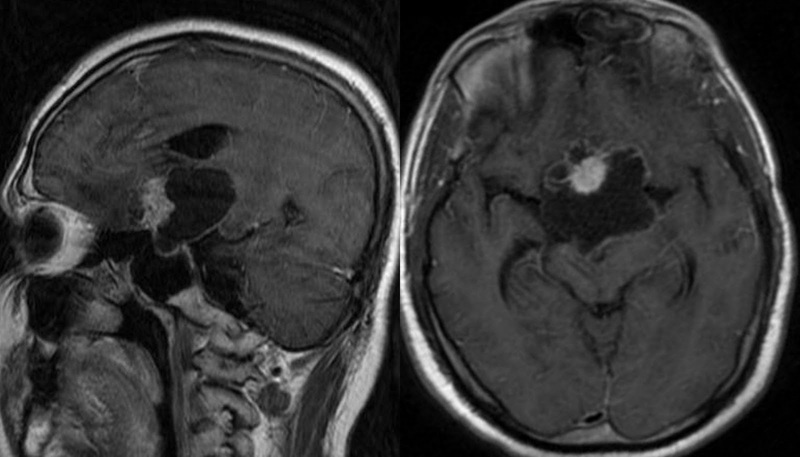 Axial T2 T1 and FLAIR with sagittal post contrast T1 images. A multi lobulated, well circumscribed, sellar supra sellar mass with solid cystic component. The solid component seen as profuse enhancing nodule anteriorly. Cystic component is hyper intense on FLAIR due to absence of complete signal suppression as fluid content is not clear. Thin rim of enhancement along its wall. Mild T2 hyper intense peri lesional odema in the adjacent frontal and medial temporal lobes. Mild dilatation of lateral ventricles appears to be due to trapping possible at the level of foramen monro secondary distortion of supra sellar anatomy. Splaying of mid brain. Both the ICA is displaced laterally. Flattened normal enhancing Pituitary seen separately at the floor of hypophyseal fossa. DD : Cystic macro adenoma. Syn : Craniopharygeal duct tumor, Rathke pouch tumor, Admantinoma. A benign dysontogenetic epithelial tumor derived from Rathke pouch epithelium. 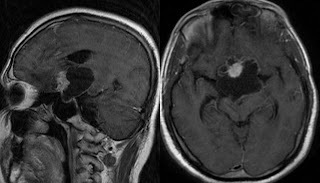 Most common pediatric intra cranial tumor of non glial origin. Histologically two types : Adamantinomatous and Papillary. A supra sellar multi lobulated mass with solid cystic component and calcifications in a young patient is a diagnostic clue. Cystic component may not be clear, often hyper intense on FLAIR even on T1w images depending up on its proteinaceous content. Rare ectopical locations are Optic chiasma, third ventricle, Nasopharynx, pineal region. For surgical interest divided into three groups as par location into sellar, pre chiasmatic and retro chiasmatic. Size is variable, often large at the time of presentation more than 5cm. Presentation is common with visual field defect with headache due to optic chiasma compression. Hydrocephalus.